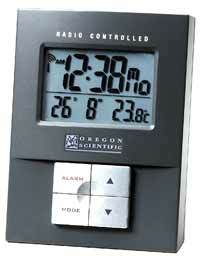 ExactSet accuracy and indoor temperature are combined into one in this atomic clock. Best of all, it is very affordable and perfect for use at home or at the office. With ExactSet technology, you will never have to set the time again. A two line LCD display features two alarms, a time/day/date display, indoor temperature, and a low battery indicator. The alarm has an 8 minute snooze. Actual size: 3.4" x 2.1" x 4.5"